Built-in Flash: Auto, Red-eye Reduction, Auto Red-eye Correction, Flash On, Flash Off; FE lock, and more. 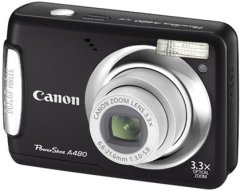 The Canon PowerShot A480 user manual provide many reference information also instructions suc has tutorial inserting the battery and memory card, power saving function info, using FUNC menu, shooting in program AE, camera setting guide, etc. Other important information such as about troubleshooting for example when you pressed the power button, but nothing happened, batteries are consumed, lens will not retract, image is distorted or not showing on TV, cannot shoot, sscreen does not display properly in dark places, screen does not display properly while shooting, image blured, appears when the shutter button was pressed halfway, subject is too dark, subject is too bright, image is dark even though the flash fired, images appears rough or grainy, eyes appear red, when you can't make settings for shooitng functions or FUNC, correct shooting does, not display or stops, zoom does not operate, and more.